BrakeMaster is ROADMASTER's 'direct' proportional braking system. 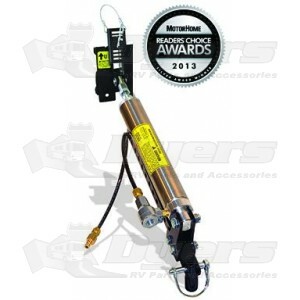 It connects directly to the motorhome's air or hydraulic brake system for rock-solid, reliable braking - brake line pressure in the motorhome controls the brakes in the towed vehicle. $799.89 To see product price, add this item to your cart. You can always remove it later. What's this? WARNING: This product can expose you to chemicals, which is known to the State of California to cause cancer and reproductive harm. For more information, go to www.P65Warnings.ca.gov. Because it connects directly to what powers your motorhome's brakes, BrakeMaster is a truly proportional, truly synchronized braking system — however you brake the motorhome, BrakeMaster automatically applies the same pressure every time. Connects and disconnects from the towed vehicle in under a minute, without any tools, adjustments or settings. Attach the brake pedal clamp, secure to the floor or the seat adaptor, quick-connect the air hose, and you're ready to tow. Weighs just 3.75 pounds and measures 17 inches in length — stores almost anywhere. Seat adaptors are required in some vehicles, and simplify the installation for others. This bracket is not supplied with the kit; you must order it separately. Works in virtually any motorhome & any towed vehicle with power brakes. Easily disconnects from the brake pedal — from towed car to road car in seconds! Meets U.S. and Canadian braking requirements. Will work in vehicles with 'active' (or 'continuous power assist') braking systems when used in conjunction with a Brake Pressure Reducer.